It's a good bet that the average Audi A8/BMW 7 Series/Mercedes S-Class buyer doesn't care much about dynamics beyond being able to merge ahead of freeway traffic while checking stock prices on their smartphones, or whatever the rich do while commuting. For the rest of us enthusiasts who dream of coming up with the kind of sports-celebrity scratch for a car that can carry the family in comfort while carving up on-ramps, there is the S8. For its first two generations, the S8 was an executive touring car. This one has a different feel. Chassis tuning is more subtle in part because the ordinary A8, with its sport and individual comfort suspension settings, is already pretty competent, and stiffer tuning can only go so far before this big sporting luxury car gets too harsh. Hence, this new Audi S8, which launches next spring in Europe and in late summer or early fall of 2012 in North America, is all about the engine. Audi shelved the old S8's V-10 for a new, 4.0-liter V-8 rated at 512 horses, peaking at 5800 rpm. Thanks to the twin-scroll turbo, the torque curve is flat from 1700 to 5500 rpm at a healthy 479 lb-ft. 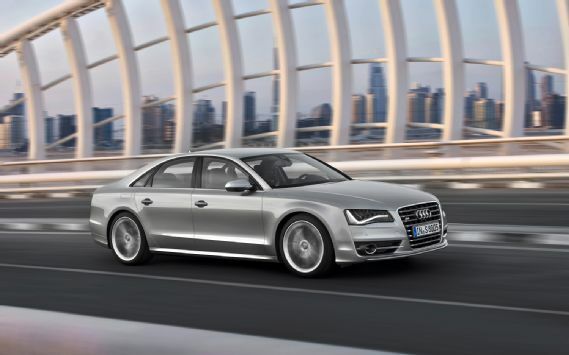 The new engine is mated to Audi's eight-speed automatic, a transmission the next S6 and new S7 won't get. As a result, those cars' engines will be tuned about 100 horses lower. Though Audi says the eight-speed won't package with that engine in these cars, it hints at RS6 and RS7 models that will match the S8 in transmission (and thus in horsepower) in the future.